January 2, 2009. 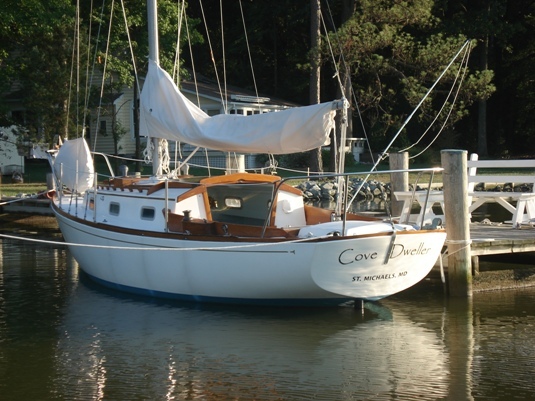 Todd Phillips advised that he has sold Cove Dweller to Mike and Sophie Harrison. This is his email, edited. 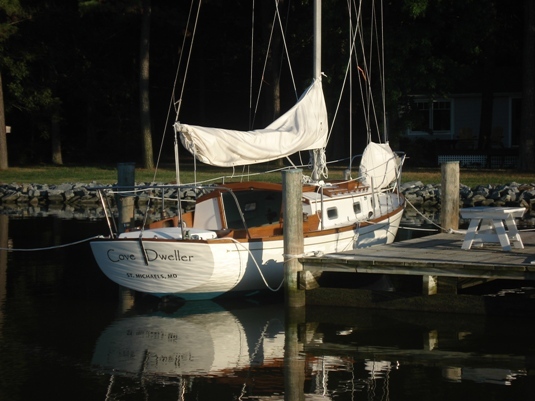 I wanted to let you know that I sold Cove Dweller to a Mike and Sophie Harrison in Annapolis late in the summer. They are experienced sailors and a great couple. 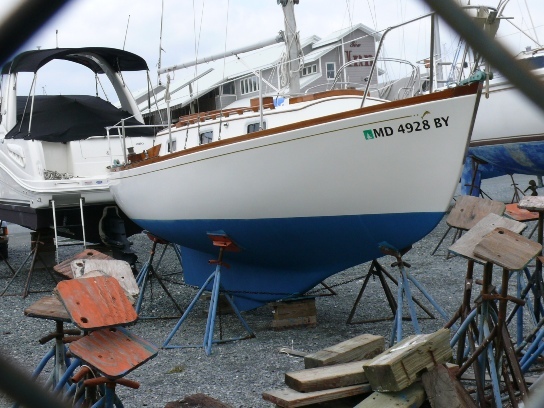 He is taking good care of the boat and even had a lift installed for her. Regards and thanks for all the help you have provided. Cove Dweller led a charmed life in Todd's care as the following pictures show. To go to Cove Dweller's new page, click here. August 15, 2007. Todd sent in the following pictures and short history. Cove Dweller seems to have it all - including a pretty nice berth too, I'd say. I am attaching some photos of Cove Dweller for your roster. 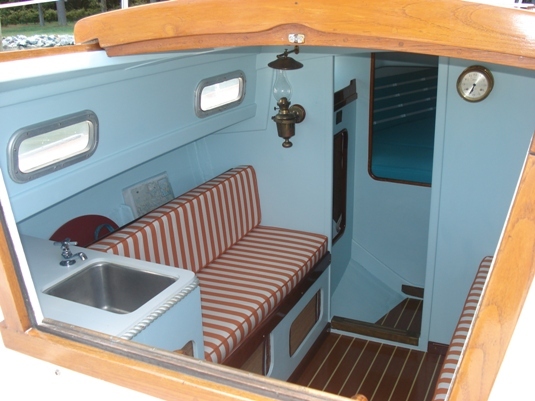 The layout of the cabin is somewhat different from other Dolphins I have seen in photos. 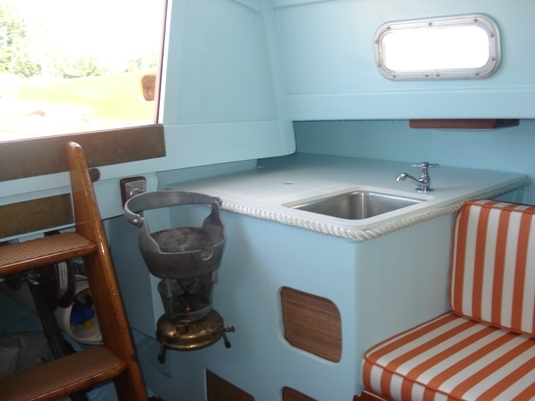 There is an icebox, sink and small bench seat to the port and a single berth to the starboard. No table and no stove (except a Primus on a gimbal). I cannot find evidence within the interior that the arrangement was ever otherwise. I did find two small plaques suggesting that she won first place in the 1980 Twin Light Association race and participated in the 1979 race. I purchased #111 two years ago from a gentleman in Virgina who had transported her from California some years earlier. 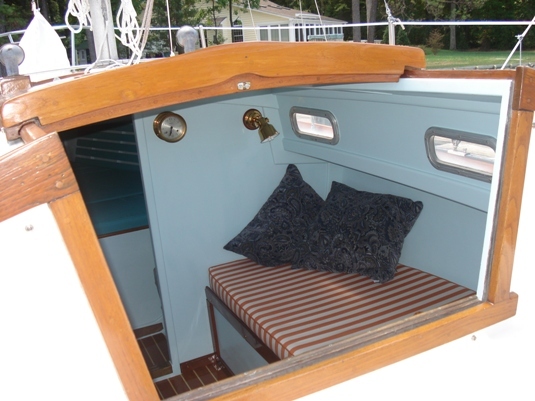 Since then I have painted the interior, put down a new cabin sole, replaced all the wiring and plumbing (w/ pressure water) and purchased new cushions and sails. Next will be replacing the portlights. 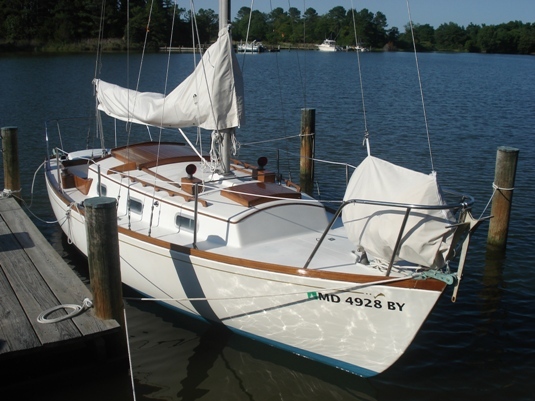 We are enjoying short cruises around the Chesapeake to familiarize ourselves with the boat and look forward to some serious pirate adventures in the near future. One of our field investigators to be was walking his dogs and snapped this photo through the chain link fence in March of last year. He became intrigued with her lines and good looks, and showed the photo to a friend who told him it was a Dolphin 24. Naturally, he found our website and is now on a Dolphin hunt - he will be lucky to find one for sale that is as well cared for as Cove Dweller. She must have just gone through her Spring prep program - or maybe she just always looks this good.